Some notes on the book’s contents. (1) The “Western Lands” of the book’s title come from Egyptian mythology about the afterlife. Supposedly, beyond the Land of the Dead, lies a heavenly Elysium: the Western Lands. 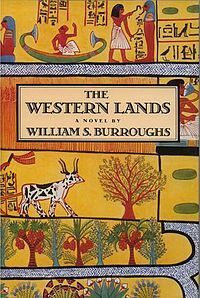 (2) Burroughs often goes off on these great riffs like you’d find at the start of a story or novel—such as a detective story, or a science fiction tale, or an exotic adventure novel about explorers in the jungle. He slips smoothly into the genre conventions, but then begins warping them, and ultimately he drops the riff once he’s gotten all the juice from it that he wants. He just about never bothers to really wrap up a sequence or bring it to a full conclusion. I especially noticed a lot of great science-fiction twists. 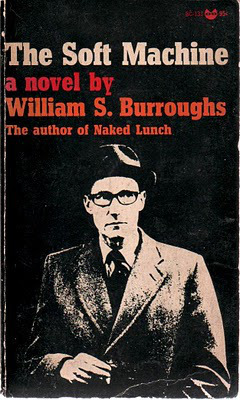 There sometimes seems a peculiar irrelevance about what is claimed for William S. Burroughs, both by those who admire him and those who do not; the insistent amorphousness of his books encourages the reader to take from them pretty much exactly what he brought to them. 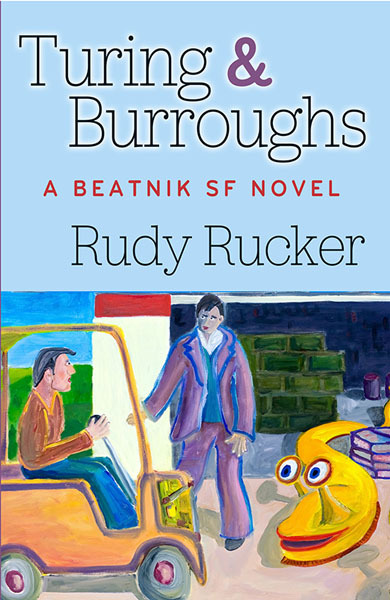 Burroughs has been read as a pamphleteer for narcotics reform. He has been read as a parabolist of the highest order. He has been read as a pornographer and he has been read as a prophet of the apocalypse. The Naked Lunch I read first on a beach in the Caribbean and the Naked Lunch I reread a few weeks ago in a hospital in Santa Monica, the book I read once when I was unhappy and again when I was not, did not seem in any sense the same book; to anyone who finds Burroughs readable at all, he is remarkably rereadable, if only because he is remarkably unmemorable. There are no “stories” to wear thin, no “characters” of whom one might tire. We are presented only with the fragmented record of certain fantasies, and our response to that record depends a good deal upon our own fantasies at the moment; in itself, a book by William Burroughs has about as much intrinsic “meaning” as the actual inkblot in a Rorschach test. Adventure Time might be the hippest cartoon on television. The art and animation are the stuff of dreams, the writing is witty (sometimes hilarious), but those two givens are only the beginning. Amid the zany adventures are moments of adolescent angst and parental regret, and sublimely understated songs that display a talent for lyrics, melody, and musicianship. The duet between Marceline and Ice King in season five’s “I Remember You,” is more stunningly poignant than any Disney movie song I can think of. And check out where Marceline could have been strumming the guitar, but someone made the unusual decision to make it a subtle jazz bass riff. 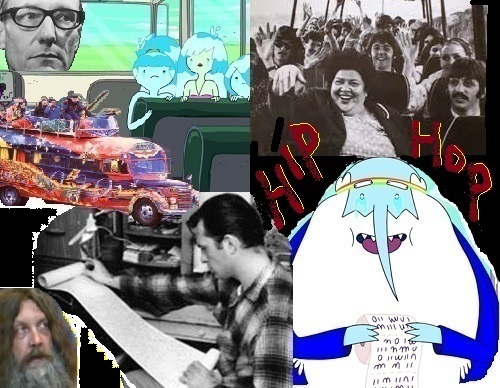 The people behind Adventure Time also know a thing or two about the literary experiments of counterculture movements like The Beats, the jazz poets, and Hip Hop. In “Thanks for the Crabapples, Giuseppe” (the thirteenth episode of the sixth season), Ice King and a band of misfit wizards take a road trip in a bus with the goal of creating their own secret society. The bus driver asserts that this trip will be “a destiny will guide us kind of thing.” That, and the wacky assortment of characters on the bus, made me think of the Beatles’ Magical Mystery Tour (1967), which, in turn, was inspired by Ken Kesey’s Merry Pranksters, whose mission in the mid-sixties was to drive across the United States in a multi-color, hand-painted bus, spreading peace, love, music, and psychedelic shenanigans wherever they went. Check out the three Nymphs, whose bodies seem to be made of flowing water. It is a beautifully trippy effect. At one point, the bus stops and all the passengers engage in writing poetry on rolls of toilet paper, which I take as a reference the continuous scroll of paper that Jack Kerouac used to write On the Road so his words could flow like improvisational jazz. 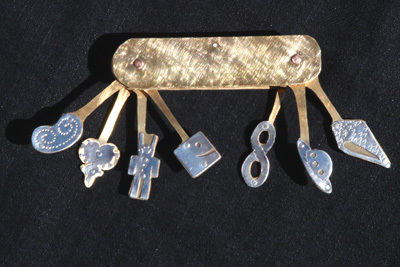 The character known as Abracadaniel says, “Let’s all write down arcane, cryptic words in unexpected new combinations and patterns.” Kerouac’s friend, William S. Burroughs, was known for recombining words with the “cut up” technique invented by Brion Gysin. Several episodes on Adventure Time feature characters rapping, beatboxing, and dancing. Finn does a beatbox rhythm to keep the beat for a song sung by Marceline in It Cames From the Nightosphere (Season 2, Episode 1). In “Billy’s Bucket List” (from the fifth season) Finn and Rap Bear compete in an onstage “rap battle.” Even the shows that don’t include rap and beatboxing are informed by a kind of Hip Hop vibe. Characters say “That’s how we roll” and “let’s bust it” and various other slang terms like “I’ma,” meaning “I’m going to,” as when the Ice King is angry about not being invited to a party. He says, “They’re gonna do me like that? So I’ma do them like this!” (From “Princess Potluck,” the eighteenth episode in the fifth season). I’m sure Adventure Time isn’t the only animated series that meets my description of “hip,” with its postmodern approach and heartfelt enthusiasm, but to me, its the best one.